About four months have passed since H&F Conservatives and their property speculator partner promised to go away and develop exciting new proposals for their infamous Town Hall office scheme. Now they’re back but the proposals are neither exciting nor that new. 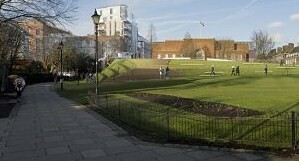 The ridiculous bridge into Furnivall Gardens remains but it’s more worrying that the scheme still contains proposals for big, shiny, new and unnecessary offices for Town Hall bureaucrats. That fact alone has tied the hands of the negotiators and meant that Conservative councillors and their officials failed to deliver even the expected cut of five floors for each of the three residential blocks of flats. Instead, it has cut the number of flats by just 30 and appears to be heralding its major achievement as reducing only one tower block, close to the river, by just four floors. That’s some sacrifice and for what? As I mentioned before, the people leading this have become emotionally attached to getting new Town Hall offices. That’s inappropriate and we won’t get a decent regeneration scheme in King Street, that has wide ranging public support until those new council offices are dropped from this project.